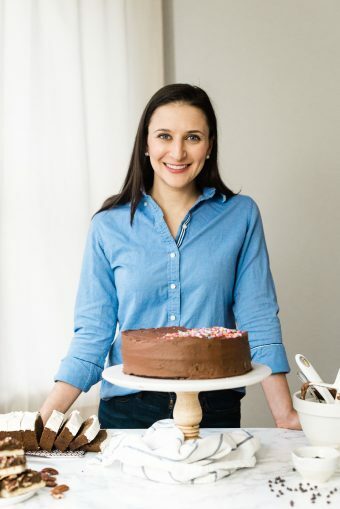 I’m not sure at what point I shifted from cooking for myself and sharing with you to cooking for you, like a virtual dinner (dessert) party, but I certainly don’t mind. I’d love to have you over for a real-world dinner party, but since my house currently lacks a dining room table, and it would be a little awkward of us to eat standing at the kitchen counter or sitting on the couch, a virtual one is the next best thing. Anyway, this is one of those recipes that fell into the category of “I really want to make this for everyone”, rather than “I’m in the mood for ___” – only, I started working on it last summer, and gave up after too many failed loaves and the end of zucchini season basically forced me to, only to pick it up again this year as soon as those weedy vines started yielding so many squash that stores have no choice but to practically give it away. A long time ago, I convinced myself that I have to make you zucchini break and so, approximately 900 attempts later, we have zucchini bread. As for why it took so long, well, that’s on me. I thought it would be simple. 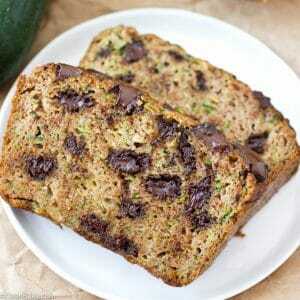 Just slightly adapt the banana bread recipe to include, well, zucchini instead of bananas and cha-ching! 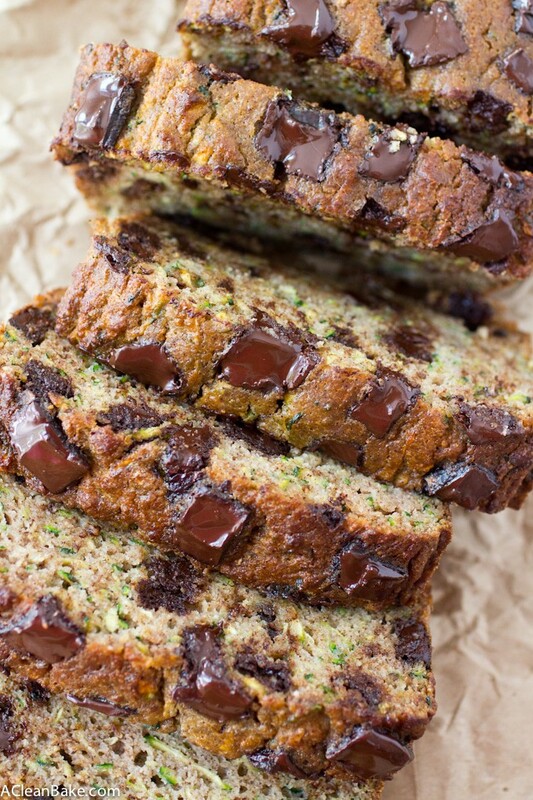 Perfect zucchini bread. That’s… uh… not how it works, and especially not when it comes to either watery vegetables or grain-free baking, and certainly not when the two factors are combined. 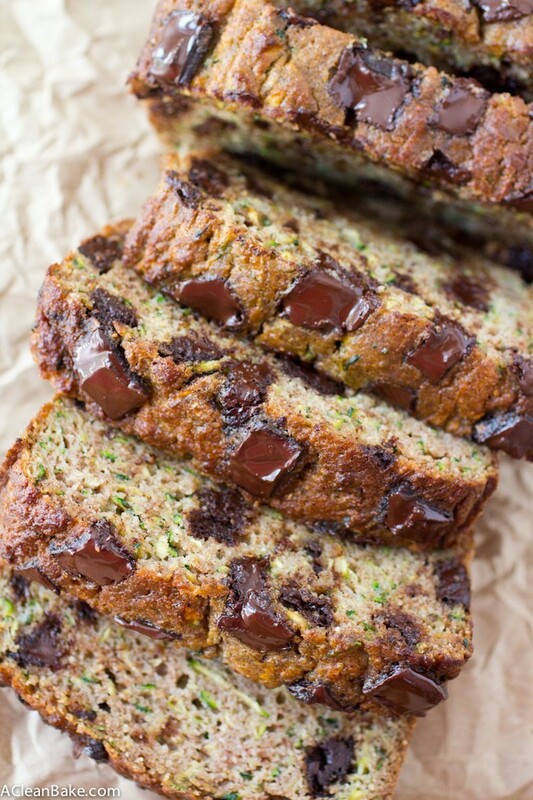 But I had already made up my mind: I was making you zucchini bread come hell or high water (…content in the batter) so I tweaked this and adjusted that and maybe also added that other thing, and made a billion more loaves until it was finally right. And it is so, so right: the bread is moist, dense and studded with specks of vibrant green that remind you that you’re technically eating your vegetables, so you’d better have another slice. Never mind that they are interspersed with thick gobs of chocolate that refuse to adopt any consistency but the perfect degree of meltiness (the current heat index is, as it turns out, good for some things). 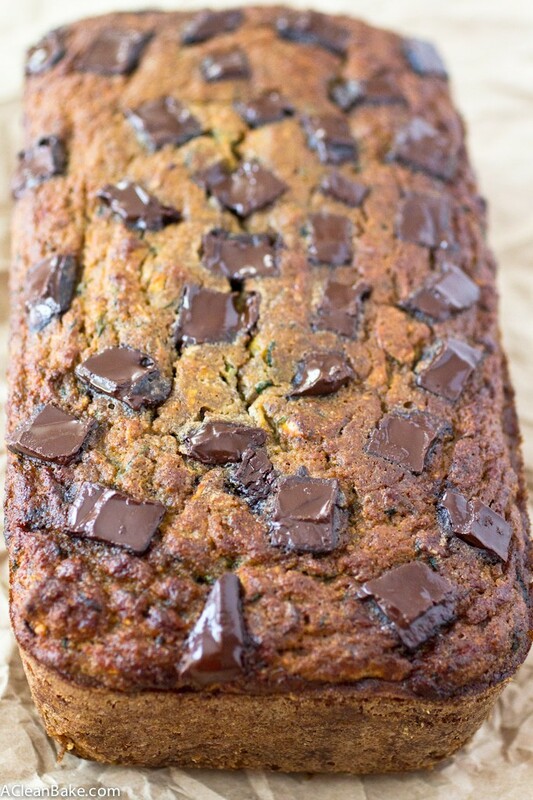 At this point, thoroughly convinced by the perfectly melt-y chocolate chunks, I admit, perhaps my motivation for this recipe everrrr so slightly shifted from wanting to make you a loaf of chocolate chunk zucchini bread to wanting to make us a loaf of chocolate chunk zucchini bread. But don’t worry: there’s more than enough to go around! 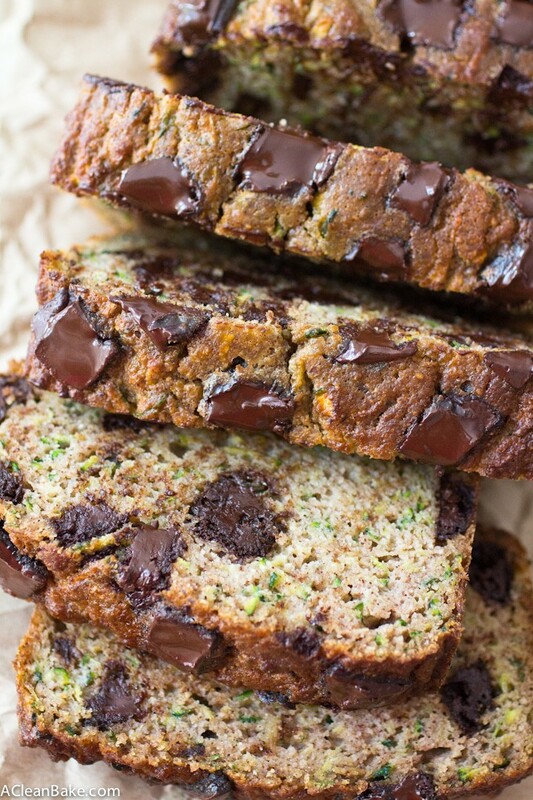 This moist and dense zucchini bread is flecked with bright green to remind you that you're eating your veggies. Go ahead: have another slice! Preheat the oven to 350F. Grease or spray an 8.5" loaf pan and set aside. In a large mixing bowl, whisk the eggs, then whisk in the oil, vanilla, and vinegar. Stir in the shredded zucchini, then set aside. In a medium mixing bowl, whisk together the almond flour, coconut flour, tapioca flour, sweetener, cinnamon, baking soda and salt. Add the dry mixture to the wet mixture and whisk thoroughly to combine. Fold in the chocolate chunks. Pour the batter into the prepared loaf pan and smooth into an even layer. Bake for 70-80 minutes until the top is golden brown and firm to the touch, and a tester comes out relatively clean (there may be a few small crumbs and some gooey chocolate on it, but that's ok). Cool for 15-30 minutes in the pan before turning out onto a rack to cool completely. Use dairy free chocolate chunks if necessary. If you'd like to make these in mini loaf pans, you'll need 4, and they will bake for around 45 minutes. Store leftovers in an airtight container at room temperature for up to 3 days, or in the freezer, wrapped tightly, for up to 3 months. Thanks, Ellie! I hope you like it!! 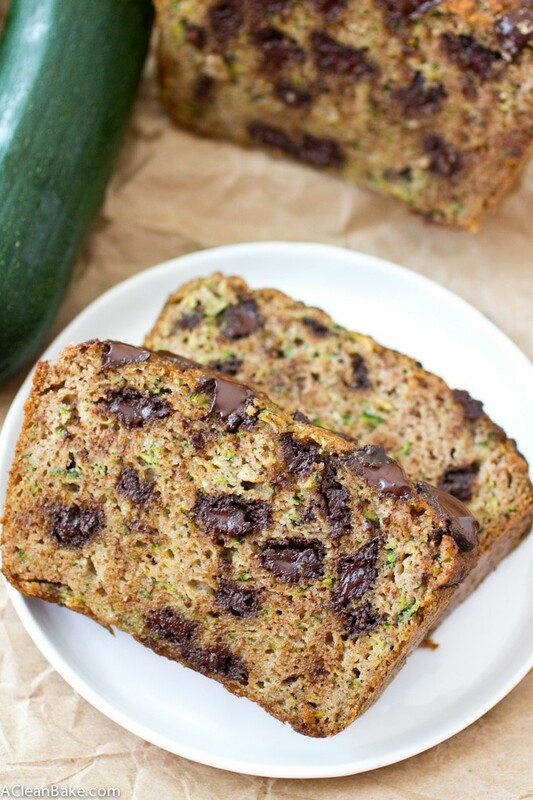 I’m all ears for chocolate in my zucchini bread and some coconut if I must 🙂 I just picked a giant zucchini from the garden so this is perfect timing. I think you must! Man I am jealous that you have a garden that provides you with giant zucchinis!